What is the oly thing that can beat a basket of freshly baked buttermilk bread? Gluten free sweet potato buttermilk dinner rolls. Fluffy, tender dinner rolls with golden brown tops and just a hint of sweetness - perfect for Thanksgiving entertaining or a low-key weeknight meal. If you have time to let them rise, they're pretty darn easy - otherwise, bake 'em up on the weekend and freeze your leftovers, or freeze the unbaked dough for bread on demand. Get excited, because these babies will be gone before you know it! Gently combine yeast and buttermilk in a large bowl. Let stand for 5 minutes (until just beginning to show some action) and stir well. In the bowl of a stand mixer, combine eggs, sweet potato puree, melted butter, sugar and salt, stirring well. Mix in buttermilk-yeast until combined. With the paddle attachment fitted to your mixer, add 3 or so cups of gluten free flour, one cup at a time, until you have a thick dough. At this point, switch to the dough hook attachment and slowly add the remaining flour until you have a stiff enough dough to knead. The key here is to go with dough -- because flour (especially gluten free blends!) all measure differently by weight and/or volume, keep in mind that the right texture of the dough is the goal, not necessarily using up all of your flour! Turn your dough out onto a floured work surface. Begin kneading, adding flour to prevent your hands from sticking as needed. The goal here is a smooth, elastic ball of dough -- not tough or dry; pliable but not sticky! Lightly spray a medium bowl with cooking spray and plop your dough inside, turning to coat with vegetable oil. Cover with a tea towel or plastic wrap (but not airtight!) and allow the dough to rise for 1-2 hours, or until about doubled in size. Preheat oven to 400° F and line 2-3 baking sheets with parchment paper. Divide your dough first into thirds, then each third into 6-8 ball-like chunks, depending on the desired size of your dinner rolls. Roll each piece of dough into a smooth ball and divide amongst the baking sheets. Cover your baking sheets with another tea towel or plastic wrap and allow your rolls to rise for an additional 25-30 minutes. Bake the rolls for 15-15 minutes (depending on size), rotating your baking sheets halfway through, until the rolls are cooked through and golden brown on top. 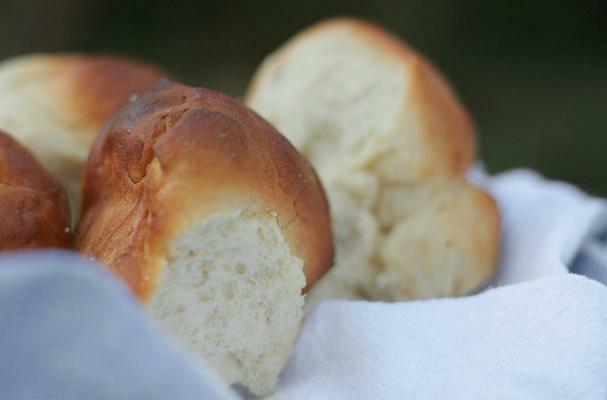 If serving immediately, brush roll tops with melted butter, serve with honey butter and enjoy!